In Campania for the Giro’s southernmost stage. Before the paranoid Romans changed its name to Benevento, today’s starting town used to be called ‘Maleventum’, translated roughly as ‘site of bad events’. Which, given the controversies of previous Grand Tours, doesn’t bode well for tomorrow’s rest day. Pre-race talk about Grand Tours always revolves around the race for the general classification, the three-week tussle for the pink jersey. But there’s always a lot more going on beyond that, with each stage playing out as a sort of mini-classic, as riders holding no hope of winning the maglia rosa are desperate to add a coveted Giro stage win to their palmarès. Never is this truer than on stages like this. Although the day’s many ups and downs are unlikely to have too much effect on the GC, they will provoke exciting racing among whichever riders go on the attack to contest the stage win. 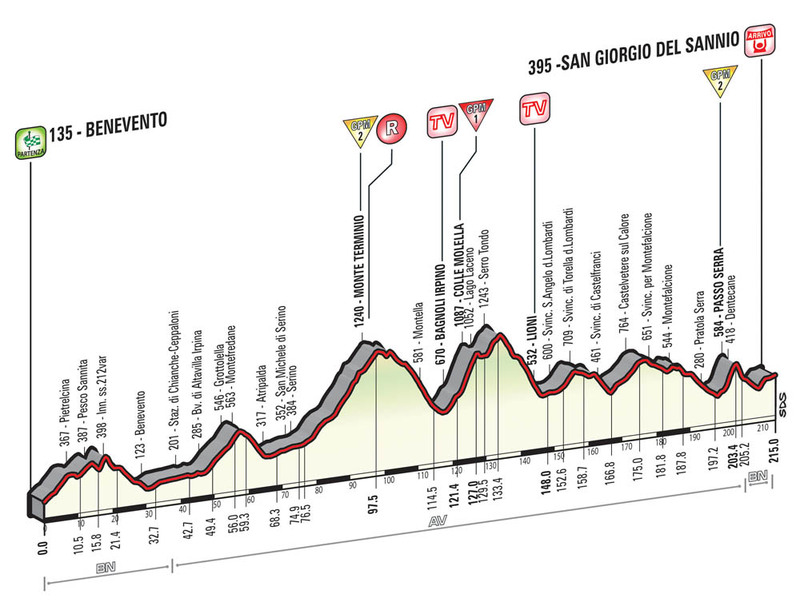 The presence of the fearsome Monte Terminio in the first half of the stage will filter out any non-climbers, while the subsequent undulating terrain should ensure that race-winning moves are attempted early and not left for the short uphill at the finish line.